Surprisingly, during my stay in March, the Seattle sun shimmered brightly over Pikes Place Market. Looking for dinner inspiration, my friend and I ventured into the market’s colorful fray. As you can imagine, this place is one of my favorite markets for visual inspiration. Texture, pattern, people, smells, and chaos flood the senses. If you haven’t been there, vendors sell fresh produce, flowers, seafood and other items in both outdoor and indoor booths. On sunny days (which can be admittedly rare depending on the season), light illuminates areas of produce, casting interesting patterns and shadows across structures. Anyway, we were poking along very slowly through the market. Every few feet I took a dozen or so photos, diving into a fit of photo-frenzy, as everywhere I looked, there was painting potential. I especially love the signs. The signs kill me every time. “Don’t Touch Me, Don’t Squeeze Me, Until I’m Yours”, one sign prudently announced. Even just the price signs are fun with their proud proclamations of freshness and their loose printing. 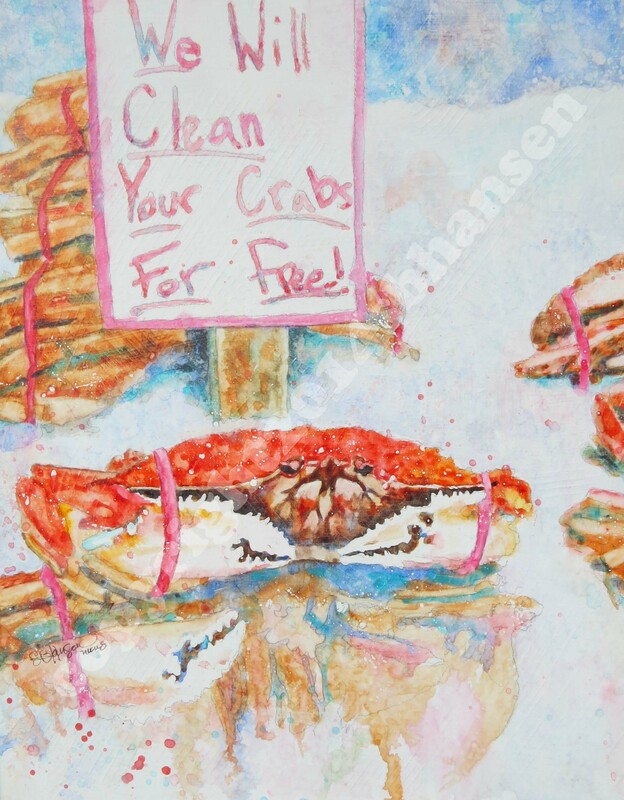 “We will clean your crabs for free,” one sign in the seafood area claimed. 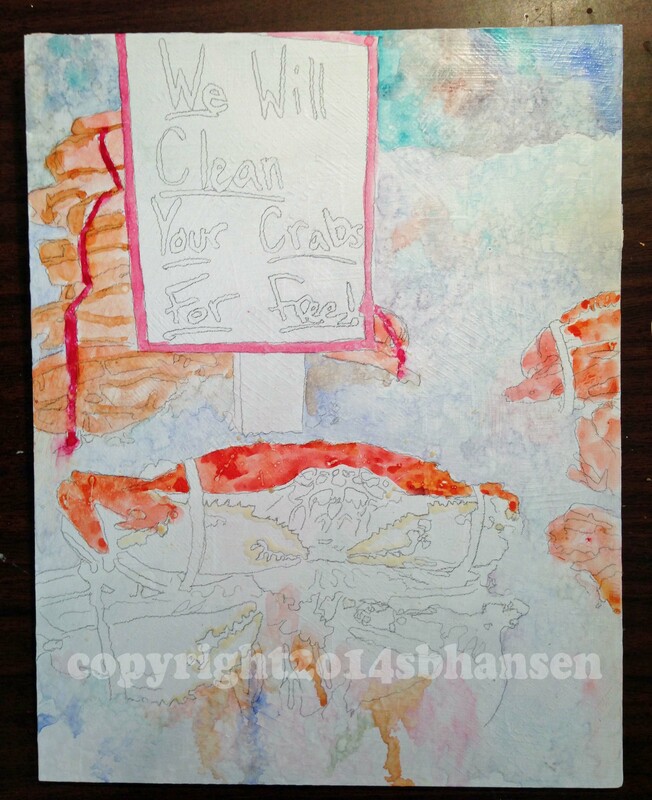 That, mixed with the crab’s crabby look, made this photo a “Must-Paint”. This poor crab, he is as crabby as can be. “Cooked” indeed. I began by changing to a portrait orientation for the painting, to make it more dynamic. 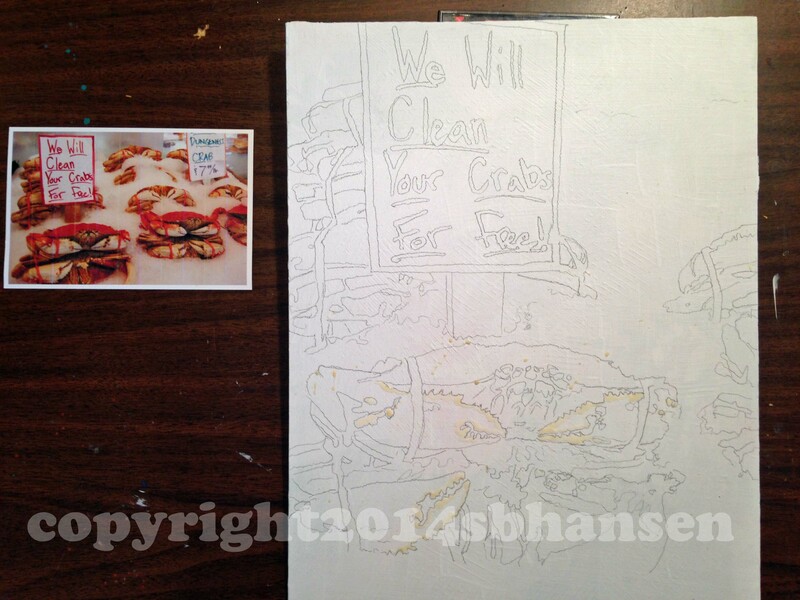 The crabbiest crab in the forefront needed to be the focal point, and arranging the canvas into a portrait orientation allowed the focal point to be more prominent in the lower LH 1/3 of the canvas. The Texi-Plexi surface had been created in advance using a plaster tool pulled through the wet gesso, for texture (no shells;)) and sprinkled salt, to give the snow/ice structure. This painting came together so easily, so quickly. Once I had the plan in mind and the drawing set, the colors fell into place as my brush danced along the surface. I absolutely love it. Hope you do as well. “Cooked” is available at Hood Avenue Art Gallery in Sisters, Oregon, for $275. Make sure you stop by and check out this little crabby crab. Visit my online store to see other super cool paintings, sbhansenart.artspan.com, follow me on Facebook and Twitter and follow this blog! See you around soon! Strange. WordPress took the worst photo of the blog and posted it as the featured photo for Reader, even though the featured photo was selected as the detail of the crab. Sorry, everyone! Thank you! I’ve had this blog since 2104, and continue to update it and change frequently, so I guess in that respect, it does take a while. Best thing to to is to dive in and start with a free template. It’s not difficult at all to set up. You will add to it and make changes just like I did, as it seems to be a growing, continuous task to keep it up to date and fresh. You don’t need to have computer expertise. Good luck!